Zaska came to us from Animal Services late on a Friday afternoon. 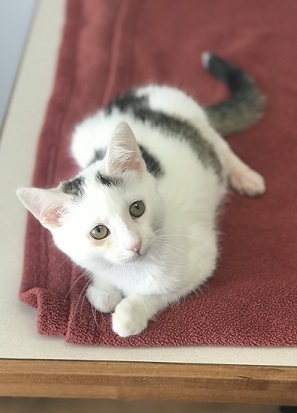 She had been picked up from the side of the road with an obviously fractured hind leg and a severe upper respiratory infection. They had arranged for her to be seen by another veterinary clinic but contacted us in hopes that we could take over her care. When she arrived we also found that she had a cardiac arrhythmia, was severely underweight, dehydrated and very lethargic. Because of her poor health we weren't convinced she would survive a sedation to place a splint on her leg so we had to wait until she was feeling better. Dr.Matt came up with a treatment plan involving, fluids, pain medications, vitamins, nutrition and antibiotics. Thankfully she looked a little better every day and her cardiac arrhythmia resolved. On Tuesday we were finally able to place a proper splint. When placed on the floor she is a bit skittish and would hide whenever there was any movement or noises. In spite of all of this when she is in someone's arms she is a little purr muffin. She also LOVES other cat company. Angie came up with a socialization plan using food rewards and a couple of her adult cats to work on socialization and confidence. This of course is made a little trickier by the fact that she had to stay quiet because of her leg. 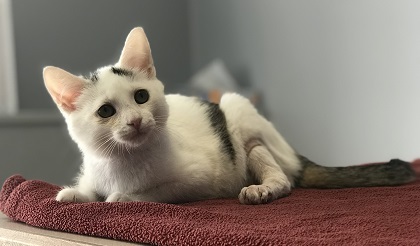 The complications with kittens and splints is that they are still growing, so what might be a good fit today can cause pressure sores a few days later. Then came daily honey bandages to treat the sores. She's still got some healing to do but she is progressing daily hopefully she will be available for adoption soon.